BIG SALE!! 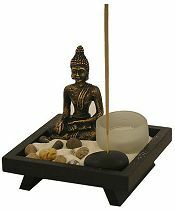 FENG SHUI STRESS CURES BIG SALE!! 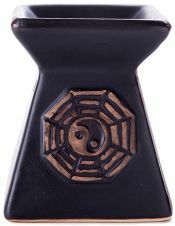 Tall white 2 piece ceramic oil warmer in shiny glazed finish with a wide bowl has dozens of black Feng Shui calligraphy symbols on the sides. 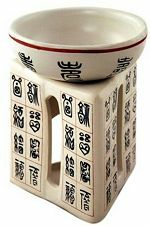 The unusual triangular base has decorative animal and heart designs to complement the bowl design. Perfect for Aromatherapy and scented oils, use with a tea light candle. Also in White or Black Finish! 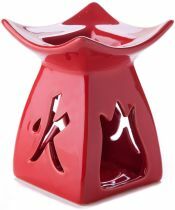 Elegant high gloss glazed ceramic Red oil warmer with "Harmony" Feng Shui Calligraphy cut out on three sides. Place scented oil in bowl and burn a tea light candle on the bottom to instantly refresh your senses. Also available in Black or White high gloss finish, to blend in with any decor! 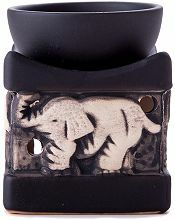 3" H x 3 1/3" W x 3 1/3" D"
Black 2 piece ceramic oil warmer in satin glazed finish with decorative elephant and safari style background on the base holder. Perfect for Aromatherapy and scented oils, use with a tea light candle. 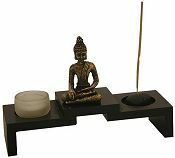 4" H x 3 1/4" W x 3 1/4" D"
Gold accented Yin Yang symbol on black finish ceramic oil warmer in a modern practical design, is easy to use and blends into any decor. Perfect for Aromatherapy and scented oils, use with a tea light candle. 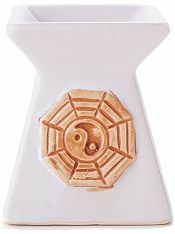 Gold accented Yin Yang symbol on glossy white ceramic oil warmer is easy to use and an excellent meditational tool. Just pour your Aromatherapy and scented oils into the bowl and place a tea light candle in the base. 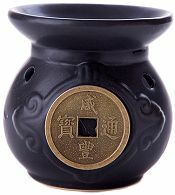 Feng Shui Wealth Coin ceramic oil warmer in glazed black with Feng Shui Prosperity and Good Fortune symbols on the large brass coin. Perfect for Aromatherapy and scented oils, use with a tea light candle. 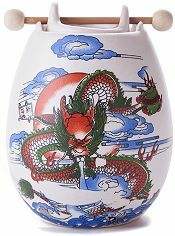 Beautifully illustrated Chinese Sky Dragon stirs up blue puffed clouds on a 2 piece ceramic oil warmer that pleases the eye and enhances any decor. Place scented or Aromatherapy oil in the removable top bowl and burn a tea light candle on the bottom to instantly refresh your mood.